I got special new crop Koshhikari rice from Niigata, Japan. 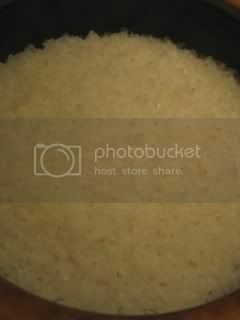 So, I made plain rice with double-lid donabe cooker, "Kamado-san". Just by the look, you can tell it's real premium rice, because each grain shines like a pearl and standing up. The aroma is somewhat sweet, too. 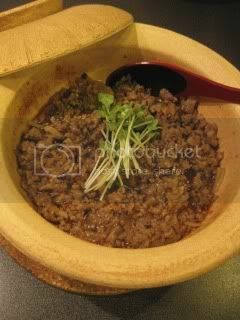 It's really, no rice can beat real Japanese rice, cooked in donabe! The texture was so perfectly bouncy. 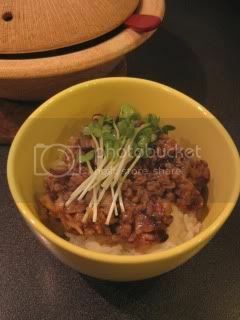 To accompany this special rice, I made simmered ground chicken ("Tori Soboro"). I made it in mini-size classic-style donabe, "Yu-Kizeto". It's a perfect donabe for this. In addition to chicken and ginger, I also added some minced shiitake mushrooms.